Active Siting simplifies the entire process for builders, realtors and buyers. 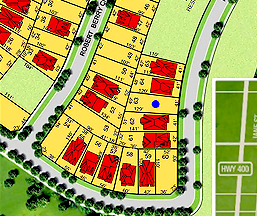 One of the key features included in Salefish Low-Rise Sales Software is it’s ability to select the right model and architectural style and then place it directly on a site plan during the buying process. The entire process occurs in real time and is completely automatic. This live process is what we refer to as Active Siting and is a term that we coined to describe the process of providing real time model and lot availability. Local building departments and municipalities usually set requirements that define overall design objectives as well as specific architectural design rules. Local developers usually create what are called Architectural Control Guidelines to implement the required criteria.